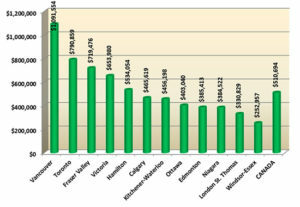 In November, the average sales price across London and St. Thomas was $322,303, up 11.6% from the same time a year ago. The average year-to-date sales price is $330,039, up 18.0% from November 2016. The following chart is based on data taken from the CREA National MLS® Report for October 2017 (the latest CREA statistics available). It provides a snapshot of how average home prices in London and St. Thomas compare to other major Ontario and Canadian centres.